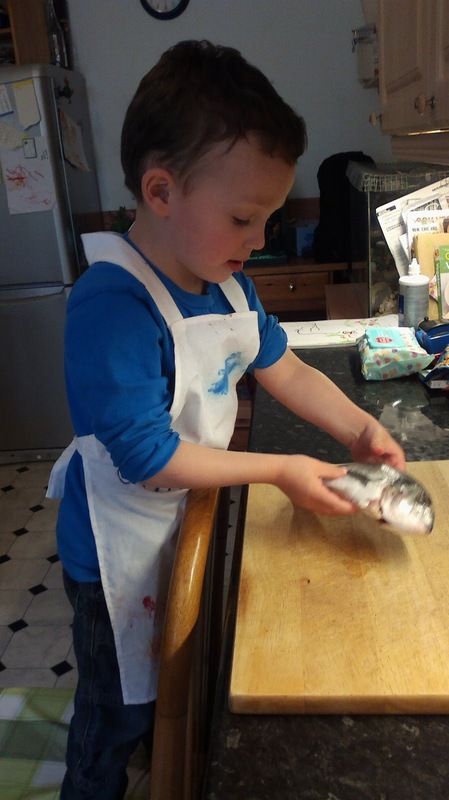 My boys have a passion for fish that would make even Rick Stein blush. Ollie will eat any kind of fish you put in front of him, from tinned mackerel on toast to raw fish in sushi. Toby's not so keen on the sushi, but has eagerly nommed everything else. The only exceptions so far have been cockles which Ollie says 'taste like bogeys, not nice bogeys, yucky bogeys' and a certain fast food outlets 'fish fingers'. Ollie also loves to shop for the ingredients for his meals, and have a choice in what we get. My favourite place to shop for fish is from the shops in the net sheds down on the Old Town seafront here in Hastings. Ollie likes to go in by himself with 10p to buy a fish stick to eat as we walk (usually on our way back from the aquarium - Ollie's not bothered that he's eating Nemo's distant relatives). For this particular meal however I wasn't even intending on having fish, but when we got to the supermarket the first place Ollie dragged us to was the fish counter. He had a great time talking to the very informative man there, who when Ollie picked out sea breem showed him it's sharp teeth, and the long spines in it's dorsal fin. The man told Ollie that when a big fish comes to eat the breem, it raises the spikes up so the big fish won't eat it. Ollie spent all day with his fingers fanned out on the top of his head shouting 'you're a big fish, you can't eat me, I put my spines out like this and it hurts your mouth!'. I tried to steer him towards something cheaper, like trout or mackerel, but he had his heart set on the 'big teeth fishy'. When we got home, we had a couple of hours of begging to see his big teeth fishies, before Toby finally had a nap. Much as I like cooking with both the boys, the fish knife is very very sharp and I get nervous enough using it with Ollie nearby, without Toby climbing around too. 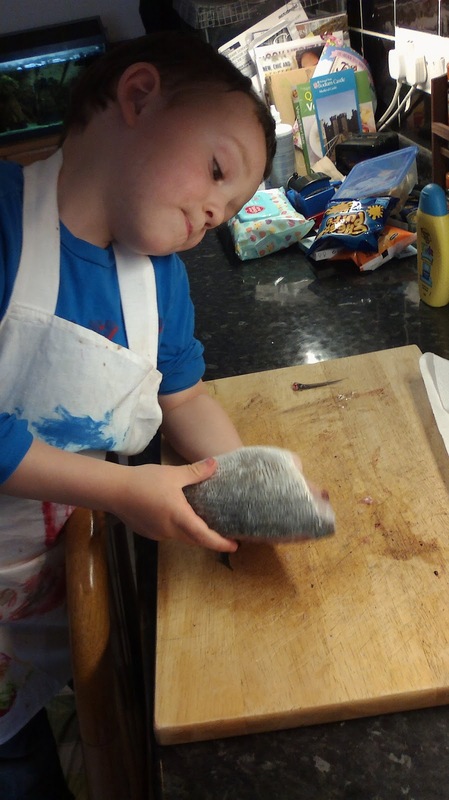 Ollie made a thorough exploration of his fish, and was especially fascinated by its fins and eyes. We did a bit of dissection exploration, which I won't go in to as I don't want to turn stomachs :) I trimmed off the fins with scissors, removed the head by making an incision behind the gills, and cleaned any stray bits of innards. Then after removing all the bits that needed removing, Ollie helped me to do a last bit of de-scaling by running a plastic knife all over the fish in the direction of tail-to-head (always worth it as there's always a few left even when it's a shop prepared fish, and those scales are really hard and sharp). Ollie rubbed olive oil over the fish and then wrapped them in tin foil, and put them in the fridge ready to go in the oven later. He also helped me to scrub the new potatoes he'd chosen, and snap the woody ends off the asparagus. Beans on toast for tea the next night after such extravagance! Seeing the food growing is the only thing this meal lacked to make it a more rounded experience, but growing food in the garden, and visits to PYO and farms are all part of the learning agenda taken as a whole year. Even so, we covered a huge variety of ideas, including; foodchains (who eats whom); food hygiene (wash your hands before and after cooking, don't rub fishy hands on your trousers and why); senses (what does the fish feel like, what does the asparagus taste like, what does the ginger for the sauce smell like...); adaptations (why does a fish look different to a person) and so on, not least the home economics aspects of cooking. Every bit of the finished meal was eaten, which tends to be the case when kids have a hand in making their own food.